I was delighted and relieved when Anita agreed to come and tackle my cat’s matted coat at home. 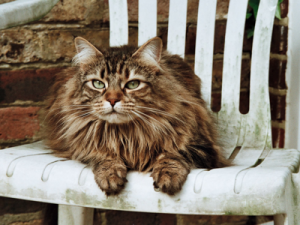 The matts had been building up over time but I had been reluctant to take my cat back to the Cat Grooming Parlour where I have taken her before as it also involved a journey by car. The last time Lenka wet herself on the way there and it was then necessary to shampoo and dry her which stressed her even further. Anita was very organised and supplied all the equipment necessary including her own grooming table. Anita managed to tackle the coat without bathing and was very gentle and reassuring, stopping periodically when Lenka got a little stressed. Anita took her time and didn’t hurry the process offering advice to me at the end of the session on how to keep the coat under control with the correct grooming methods and right choice of equipment. By the end of the session, Lenka jumped down and went straight to her food bowl which was very reassuring. I don’t think she minded having her hind quarters and tummy shaved especially since the heatwave ensued. She has since been lying on her back in the garden in the sunshine letting the air circulate and looking very pleased with herself!